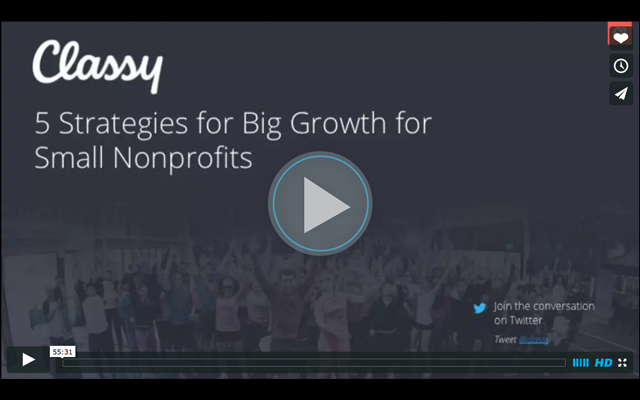 Classy recently hosted a webinar on growth strategies for small nonprofits. Our presenters were Stina Rubin and Adria Orr, Account Managers who work to help our partners succeed. They brought their insights to the table to show how even a small organization can prepare for and spur growth. Here’s a quick recap of five important lessons from the webinar. You can watch the full recording below! This first strategy is all about being practical today to achieve your long-term aspirations. Practicality doesn’t have to be a dream buster. Thinking big means that you eventually have to think about scaling up your work. To serve more people, you need to have the infrastructure to execute as you grow. This is why it’s so important for nonprofits to invest in their operations. Whether it’s the right CRM or durable, long-lasting equipment, you need to have the tools that not only work for you now, but will remain useful as you scale your programs. Another important step to achieving your mission is being able to say “no” when your organization is asked to do something outside of your wheelhouse. Nonprofit professionals are passionate people, but you must be able to prioritize your central goals and channel your time and resources toward them. Part of what keeps some organizations small is that they don’t recognize the full size and strength of their network. Sure, you may be a one- or two-person shop, but that doesn’t mean you are entirely alone. Stina and Adria outlined three ways to find people to help with your mission. Look outside for volunteers – For small social impact organizations, volunteers can be vital. Treating volunteers like valued members of your team will keep them engaged and involved for the long-term. Create volunteer position descriptions to help attract people with the skills you need. Look around your board room – Your organization’s board is a tremendously valuable asset. Tap into their ideas and personal networks to find marketing and partnership opportunities. It’s also common practice for nonprofits to establish a “give or get” fundraising requirement for board members. You ask them to provide a certain amount of financial support, either through personal donation or through fundraising. Look within your organization – Don’t forget about you and your coworkers! Just like your board, other team members may have valuable contacts or ideas. If you know someone who could support your organization in any way, be willing to ask for help. Stina remembers working for a small nonprofit and hearing they were the community’s “best kept secret.” While that’s a positive sentiment, you don’t want your organization to be any kind of secret. Small nonprofits can gain visibility by making connections and identifying the opportunities at hand. This means that you should promote your organization by emphasizing what you are achieving WITH donors and partners. Be sure to use the second person (“you,” “your”) in communication to convey that donors themselves are making a difference. Much like finding the value within your team, nonprofits can find ways to get more exposure by considering the avenues they already have access to. This includes social media, local events, emails, and newsletters. Finding a local business or other organization to partner with allows you to reach a new audience without emptying your bank account. Nonprofit organizations simply cannot afford to be afraid to ask for support. If you’re not asking, someone else is. And yes, this means you will ask people more than once. Our Account Managers pointed out that when a donor says “no,” it doesn’t mean “no” forever. People often need to hear about an initiative multiple times before they actually take action. This is why you shouldn’t be devastated if no one immediately jumps onboard a new kind of fundraising campaign. It’s important that organizations have a communications plan for their supporters. This is much more than sending a “thank you” message after a donation. Whenever someone donates to you or subscribes to your communications, they become a member of your community. You must keep them updated and inspired continuously. If you want others to love and support your organization, you have to have a strong sense of self. A big part of this is refining your story and understanding what your nonprofit stands for. Not only must you know what your organization does, but you must also be able to relate your story to others. Spend some time preparing your elevator pitch. This is when you explain succinctly what your nonprofit does and why people should get involved. If you happened to be in an elevator with a potential donor or sponsor, could you appeal to them before their floor arrived? Finally, make sure that everyone on your team speaks about the organization consistently. Unity is an important element of having a strong brand. Discuss your nonprofit’s voice and personality to ensure everyone can represent you well. To learn more about how you can grow your nonprofit, check out the recording below and download the slides.